I sometimes wonder which fictional character had more of an effect on the world of wine – Miles’s rant about the inadequacies of Merlot in Sideways, or The Silence of the Lambs' Hannibal Lecter introducing the world to the pairing of Chianti with fava beans and a side of census taker. It’s the latter wine that we’re here to discuss – Chianti. Specifically, Chianti Classico. Chianti, in a theme you’ll likely notice if you’re a regular visitor to these parts, is not a grape. Chianti is a region of central Tuscany near Florence. In that region, the primary grape is Sangiovese, the backbone of a number of Italian wines. Wines from Chianti are legally required to be at least 70% Sangiovese. As well, “Classico” does not refer to any “classic” style of wine production. Classico is a designated subregion within Chianti considered by many aficionados to produce the highest quality juice. The offense that brought the poor census taker to his end in Silence of the Lambs was trying to categorize Dr. Lecter. The winemakers of Classico have no such problem with categorization. In fact, where there used to be two categories of Chianti Classico – within the last couple of years, the region’s added a third. Wines labeled “Chianti Classico” are produced from grapes grown in that subregion. They must be at least 12% alcohol, be at least 80% Sangiovese, and be aged for a minimum of seven months before release. They have an icon of a black rooster on the label, and can be had for around $10-15. “Chianti Classico Riserva” was previously the highest level of Chianti. The Riserva wines must be aged for a minimum of 24 months and have a slightly higher alcohol content, in addition to the regular Classico rules. In 2014, the region created a new designation – “Chianti Classico Gran Selezione,” which sounds impressive. These wines must be aged a minimum of 30 months, and must be produced from grapes grown specifically by the winery. This designation was supposed to indicate a new, higher level of quality – basically the creation of a readily identifiable category of top “estate wines” for the region. This reclassification is not without controversy. While there are some technical differences – slightly higher alcohol content, aging, pH levels – a winery could conceivably age a “Riserva” wine for six additional months and label it “Gran Selezione.” Additionally, wines in this category are checked for quality by a panel of judges – an addition which veers dangerously close to the hyperclassification of vineyards found in France…and few Italian winemakers want any part of a parallel to their major wine producing rival. There is, however, one considerable difference between Riserva and Gran Selezione – price. Riserva wines commonly cost $20-40. Most Gran Selezione wines start at around $40 and go up from there. But I don’t want to cast aspersions on this new classification. Most winemakers seem to be keeping with the spirit of the new classification, which also allows smaller winemakers to offer their top wines with a special designation, rather than getting lost among the Riserva created by larger producers. But does the new designation really represent an increase in quality? 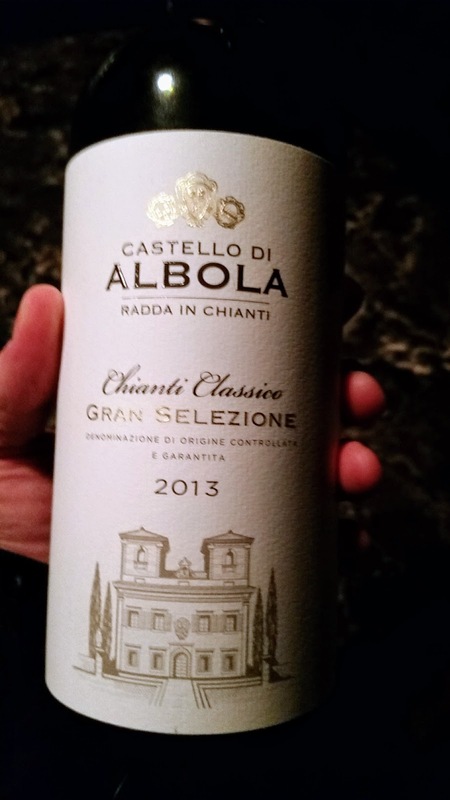 I had the opportunity to try a couple of wines from Castello di Albola. Specifically, the Castello di Albola 2014 Chianti Classico (~$17) and the Castello di Albola 2013 Chianti Classico Gran Selezione (~$70). I tried to find a bottle of the Albola Chianti Riserva to do a true side-by-side-by-side of the three levels, but I couldn’t run one down in time for publication. Regardless of quality, Chianti is not a wine that I prefer to drink on its own. There’s something about the chalky backbone that just does little for me without some kind of food to work alongside. But for pairing with traditionally Italian flavors like red sauce or roasted meats and vegetables, it’s difficult to go wrong with Chianti Classico of any stripe. That in mind, I whipped up a nice batch of pasta in a red sauce with mushrooms and Italian sausage for the tasting. Let’s just get this out in the open – the Gran Selezione is a stupendous food wine for a pairing like this. The flavors are rich and fruity, with a good tannic backbone and plenty of spice notes to go along with a plummy, cherry-slathered body. The finish lasts as long as any Italian wine I’ve had not from the Piedmont (Barolo, Barbaresco). With food, it marries itself strongly to the traditional Italian flavors. The “standard” Chianti Classico is also very good. 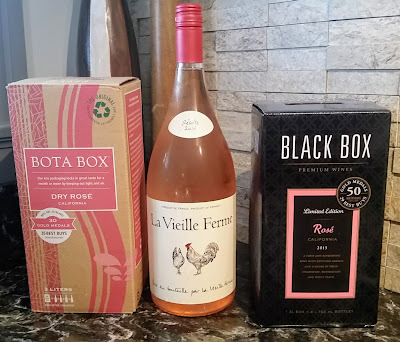 The wine is much more straightforward – tending towards the cherry end of the spectrum. The tannins aren’t quite as bold, nor is the finish as long. That said, as good as the Gran Selezione was, it wasn’t a $50 better bottle. Fast forward one night. The Sweet Partner in Crime decided to put together one of her "repurposed leftover quesadillas." This one included beef, mushrooms, wilted beet greens, caramelized onions, and pepper cheese. We had saved some of each wine to try the next night – and the Gran Selezione really showed its colors. I never expected that a meal made from leftovers would have truly decadent flavors, but the more expensive wine turned an “eat in front of Netflix before chilling” meal into a delectable treat. If a special occasion meal that includes varied, earthy flavors is on the menu, then splurging on the Gran Selezione might be a real consideration. I would suggest, if you’re interested in trying a higher end Chianti Classico – that you “climb the ladder” with your selections. Talk to your local wine guy or gal about a solid Chianti Classico Riserva. If that rings your bell, consider moving up to the big bucks bottle. And finally, to come full circle for a moment -- one of the few foods that Chianti would not pair with particularly well is liver. Organ meat tends to have a metallic taste from the high levels of iron, and the rich flavors would run over all but the fullest of Chianti. A better choice for our hypothetical census taker meal would have been a wine with more tannin and fuller fruit flavors. What wine would fill that bill? Ironically, Merlot would have been a superior choice. It’s a shame that we never got the “Hannibal and Miles” buddy comedy we all deserve.